Valentine's day is my favorite holiday and my birthday is in February, so I love hosting February matchbox swaps! For this easy, fun times, international matchbox swap we will each have just one partner. You will make your partner one love, Valentine's Day, or February themed matchbox - the small 32-count size (approximately 2 x 1.5 x .5 inches). 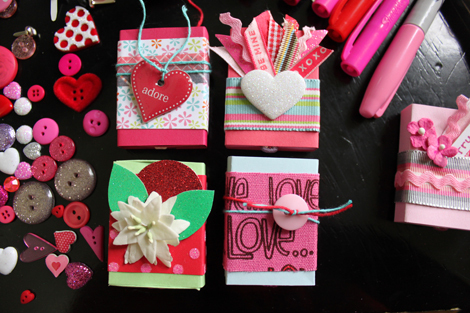 I use this template to make my matchboxes out of cardstock, but most swappers decorate real, empty matchboxes. You also need to fill your matchbox with similarly themed goodies. 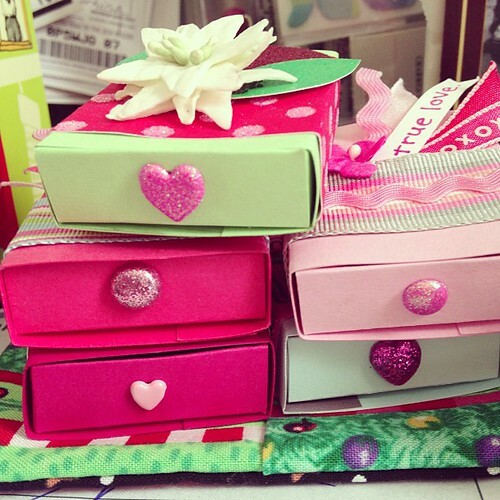 I like filling my boxes with stickers, ribbon, brads, buttons, beads, and other little embellishments. Anything goes, but make sure you send something you would love to receive. You aren't required to send any extras for this swap, but remember to include your name, your swap-bot username, and your email address in your package. This swap is international. Everyone must have over a 4.9 rating to participate with very, very few (like zero) no sends. New users are welcome, but I must ban anyone who looks fishy. (A filled out profile is required.) It is a harsh world out there and I want to keep my matchbox swappers safe! This swap has a quick turnaround, but you can start working on your matchbox now! Remember that this swap is sender's choice and you can get a love, Valentine's Day, or February themed matchbox in this swap. If you don't like any of those things, this probably isn't the swap for you. Let's have fun! Bonus: download some fun Swap-bot Valentines here. Wish this was just USA!! Very happy this is international! I am a newbie can I join this swap it looks fun!! I already have some really fun matchboxes started that I will be trading via an international group of women I met while in Europe. I would love to be included! Yes, new users are welcome! I have been practising decorating matchboxes, and oops appear to have found a new addiction!!! anyone looking for a usa matchbox type swaps I am hosting a few different types. Yay! So many people are signed up! I'm excited. I'll be going over participants and assigning partners asap. FYI: If your profile is totally blank, you will be removed from the swap. Ok! Partners have been assigned!! I did have to remove a few people with blank profiles, but otherwise, this seems like an awesome group of swappers!! Have fun! p.s. I DO angel my swaps. Two weeks after the send deadline, if you have NOT received and you HAVE rated your partner honestly with a 1, contact me and I will send out an angel package. Great!